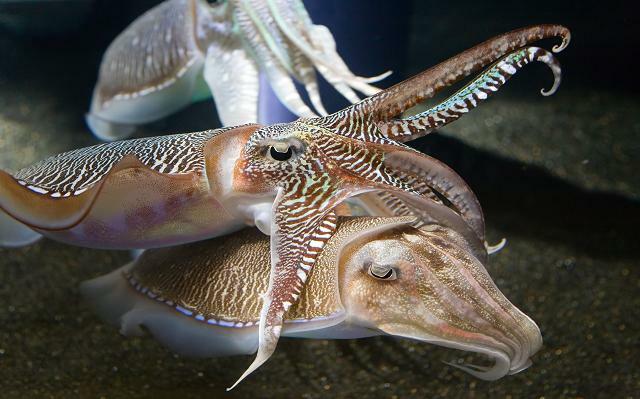 What is the Difference Between a Squid, Cuttlefish, and Octopus, and How do you Tell the Cephalopods Apart? Squids, Cuttlefish and Octopuses are mollusks that belong to the cephalopod group of invertebrates, meaning they have eight legs. Squid have a hard inner-body shell called a pen, instead of an outer one like clams and snails. The octopus, in contrast, has no shell at all. Its outer mantle, or skin, is thick and tough, protecting its boneless, fleshy body. Cuttlefish also belong to the cephalopod family, but have an internal structure called the cuttlebone, which is porous and composed of aragonite, to provide the cuttlefish with buoyancy. The cuttlebone is unique to cuttlefish, and is one distinct feature that makes them different from their squid relatives. Cuttlefish are among the most intelligent invertebrates and is a very popular Risotto dish in Italy, as well as a snack food in Asia. Which Cephalopod can Swim Faster, a Squid or an Octopus, and How Fast? Is the Giant Squid Bigger than an Octopus and How Big is the Second Biggest Cephalopod in the World? Which cephalopod can swim faster a squid or an octopus?